(WTVM) - The people in a community are often a reflection of the entire population. When citizens step up to do the right thing, it makes everyone around them feel better about each other. That's how we felt when we covered the story of a Columbus couple who helped rescue swimmers in trouble down in Panama City Beach. Thanks to Shaun and Sarah Jernigan, a family of swimmers who were stranded and struggling in a dangerous riptide current, were brought safely back to the beach. 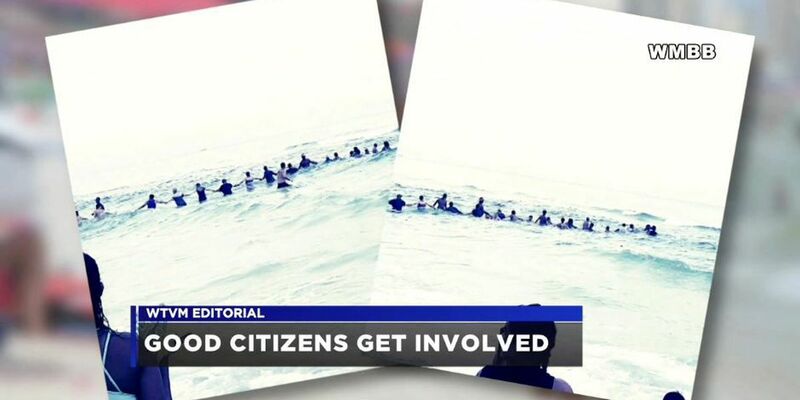 Shaun and Sarah, from Columbus, realized the group of swimmers were in distress, and they decided to get involved and do something. So they formed a human chain – and walked into the water, arm-in-arm, using each other for support. The chain eventually numbered 40 people. the swimmers in trouble were all ushered back safely to shore. The Jernigans knew if they just jumped right in and swam to those swimmers, they themselves might get trapped in the current, too, making the situation even worse. So they stayed cool and worked together with other tourists to reach the swimmers in a big line and get the rescue done safely. That takes good character and a willingness to get involved in helping others. That's being a good neighbor. And that's what makes for a strong community. We think that Shaun and Sarah Jernigan are special people who deserve the recognition they've received. They proved they are good neighbors, even if those neighbors were strangers who never expected to get their help.